Retire in Costa Rica and enjoy a quality of life unmatched in most retirement havens. This Central-American country boasts fantastic year-round weather, low cost living, and affordable health care. If you are searching for a comfortable retirement in a tropical setting that you can afford, look in this part of Central America. You can retire in Costa Rica and have all your expenses paid for about $1500 a month. Of course you could spend a lot more and live lavishly. But here, we are talking about a comfortable existence where you are not scrimping just to get by every month. The cost of living in Costa Rica is affordable enough whether your pockets are meager or overflowing with dinero. Retiring overseas means savoring new experiences. Extend your boundaries and have the time of your life. Discover the wonders of a new shore. Depending on your budget and where you choose to live, retiring overseas can be much more affordable than you can imagine. Located in Central America, between Panama and Nicaragua, Costa Rica is a land of breathtaking valleys, towering volcanoes, and 800 miles of dazzling coastline. View what other visitors consider to be the top things to do here. You'll get first hand knowledge of their experiences. And get tips on what to do. Take extra passport pictures before you retire in Costa Rica. Other overseas retirement tips include getting the recommended vaccinations. Most diseases can be prevented with a simple vaccine. Consider hostel accommodations or bed and breakfast inns instead of expensive hotels before you retire in Costa Rica. They are cheaper and very common in South and Central America. Another money saving tip is to use public transportation instead of a taxi whenever possible. 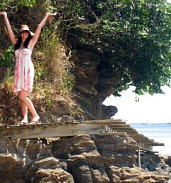 Learn more cheap travel abroad tips here. Apply simple retirement planning tips to increase the money that goes into your pocket. Take control of your retirement and learn how to cut your spending without affecting your quality of life. Choosing when to retire can be your choice. But you have to be serious about having a plan. Having a goal is the first step. Find out how to devise an early retirement plan you can stick to with a little practice. The average temperature in Costa Rica is between 22°C and 27°C (71°F and 81°F). No scorching summers or freezing winters here...Which translates into cheaper utility bills. Northern Costa Rica abounds with white- and dark-sandy beaches. Playa Flamingo, Playas del Coco and Playa Tamarindo are a few of the many beautiful beaches found in the Guanacaste area. 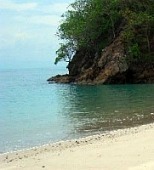 A large number of expatriates have discovered paradise by retiring in this part of Costa Rica. Central Pacific is considered Costa Rica’s sport fishing capital. It is home to the popular surf location of Jaco Beach and Playa Hermosa. Lavish resorts and an international marina are also found here. Simplify your trip to Costa Rica with all the information you need in one place. Locate Airlines for domestic travel within the country as well as international travel to and from this pacific coast beauty. South Pacific Area is home to Uvita...A fast growing area due to its breathtaking ocean and mountain views. And it is one of the main reasons why a growing population is choosing to retire in Costa Rica. Dominical is a sought after beach town and home to exclusive communities. Pavones offers spectacular beach front living off the crashing waves of the Pacific. Here, surfing is a main pastime. Golfito is an ideal spot for boat owners and fisherman with stunning views of the surrounding rainforest. If you prefer the more soothing waters of the Atlantic, then head for the pristine beaches of Playa Bonita, Puerto Viejo and Playa Manzanillo...Where retiring in Costa Rica means snorkeling and diving among the many reefs whenever you want. Share your "What to do in Costa Rica" tips with other visitors! What do you consider to be the Top Things to Do in Costa Rica? If you've been there, done that, why not help others by sharing your first-hand tips? Utilities are 30% less than in the U.S., about $70 a month. Maid services and hired help will run you about $1.00 an hour. Standard. Rental property in a nice area is between $500 - $800 a month. Always rent first if you plan to retire in Costa Rica. Buying a property is not necessary to enjoy the benefits of living in a tropical country. Public transportation is cheap--Less than $0.50. And a taxi is under ten bucks. Ocean-view property is 70% less than coastal properties in the United States. Health Care in Costa Rica is of high standards. Private clinics are well-known for cosmetic surgery, ocular laser surgery and dental care as well as many others. Use an international carrier for health care overseas with a high deductible in actual emergencies and pay out of pocket for regular occurrences. A private room in a hospital is about $80-$100 a day. Surgery is less than $1000. Medical insurance at a clinic is less than $65 a month. This a strong reason why many are retiring to Costa Rica. 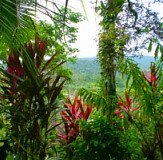 There are no capital gains on real estate taxes when retiring in Costa Rica. And property taxes here max out at 25%. Therefore you only pay $250 a year for a property worth $100,000. You still need to be aware of paying taxes overseas when living or retiring in a foreign country. The amount you actually pay in taxes will depend on your circumstances and where you retire. Depending on your choice of retirement locations income tax will only apply to money earned locally. Even when establishing residency overseas you continue to be a citizen of your own country. It only means you are no longer a resident. You may even decide to become a dual citizen. Requires proof of $600 a month in income. Renewal is every two years. Requires proof of $1000 a month in income for the next five years. Invest $50,000 in tourism, $100,000 in reforestation or $200,000 in any other business and you will be granted temporary residency. North Americans can legally live in Costa Rica for three months before they must leave for three days. Then you can return for another three-month period. You are entitled to the same ownership rights as Costa Rican residents. And that includes owning property, whether you retire in Costa Rica or not. If you are thinking about investing during retirement look for a stable government and a re-sale market. You want to get the best deal for your money. If you are an American citizen, be aware that the U.S. government cannot confiscate real estate investments in foreign lands. This holds true if you retire in Costa Rica or elsewhere. By choosing to retire in Central America you will benefit from Spring-like weather all the time for less than $1500 a month. It is one of the best preserved colonial cities on earth. You can retire in Ecuador for about $1000 a month...probably less. And this does not mean living in the jungles of the Amazon. It means living a very comfortably existence with household help. Living and retiring in Chile means enjoying the best beaches and ski resorts in the world...all at a fraction of the cost. And of course, some of the best wines. Remember that the seasons are opposite to those in North America and Europe. The cost of Retirement in Panama depends on where you choose to live. Some spots are more expensive than others. Panama City costs about $2000 a month for a modest lifestyle. In the colonial town of Las Tables, you can live very comfortably for less than $1200 a month. Live in Costa Rica for six months before making a decision. This holds true for any overseas retirement venture. Test the waters first and see if this new lifestyle is for you. ...where the cost of living, health care and year-round weather will make you think you’ve gone to heaven.